This card features an original gorgeous handmade design. A very special luxury anniversary card. It is then finished with jeweled butterflies, silver satin ribbon, pearls and diamantes for the ultimate finish. 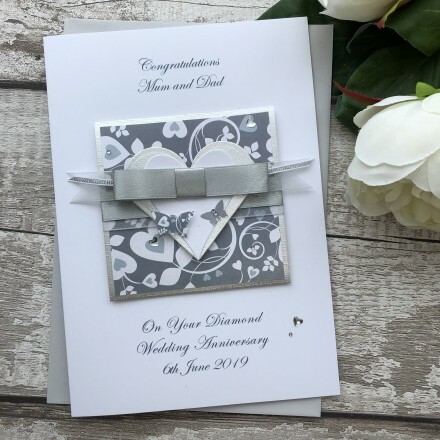 This personalised handmade wedding anniversary card is teamed with a matching square envelope, protected in a sealed cellophane bag and sent to you in a double board outer envelope to ensure it arrives in pristine condition.